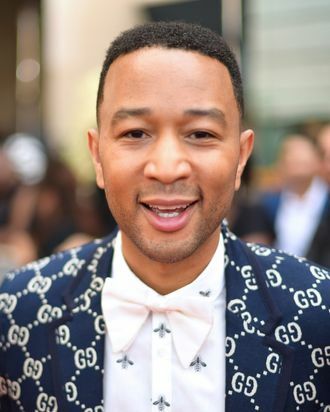 With the announcement of the Emmy nominations this morning, John Legend has not one, but two chances of winning an Emmy — which means that in addition to his Grammy, Oscar, and Tony wins, he’s within reach of an EGOT. Legend is up for an Emmy for Outstanding Actor in a Limited Series or Movie for playing Jesus in Jesus Christ Superstar Live in Concert, and for producing the show alongside theater legends Andrew Lloyd Webber and Tim Rice, who are also an E away from their own EGOTs. Jesus Christ Superstar earned 13 Emmy nominations total, the most of any live TV musical. Along with Legend, co-stars Sara Bareilles and Brandon Victor Dixon also snagged nods for their roles. “For all three of us, as actors, to get nominated is pretty incredible,” Legend said, adding that he’d been texting with Bareilles and Dixon this morning.